Collaborative Marketing is fantastic strategy that combines two companies resources to achieve an outcome. 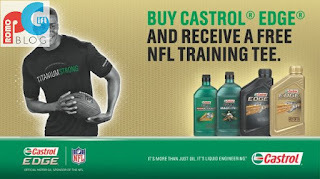 In this particular case, Castrol have teamed up with NFL to implement a gift with purchase campaign. Customers can receive an NFL T-shirt with a purchase of Castrol Edge motor Oil. In todays environment where markets are saturated and competition is high collaborative marketing offers an opportunity for businesses from different industries to join together, partially in the case of promotional strategies. The advantages of this are both companies offer there main core competency to the table and thus both benefit in from each. Castro benefit through acquiring NFL's prestigious name and NFL benefit through gaining space to promote and print their brand. Overall companies, by offering a free gift with purchase will achieve greater brand awareness and sales. However collaboration needs to be thought through, particularly by linking the right/similar brands together otherwise these benefits won't be achieved. Overall, Castrol and NFl has managed to brand two complementary products, this will lead to greater brand awareness for both companies and increased sales of both products. If you're interested further promotional gifts please visit our blog here.